What are the Different Types of Birthmark Treatment? Surgery is usually the last resort in birthmark treatment. Different types of birthmark treatment include oral medication, injection, laser therapy, and surgery. In some cases, successful birthmark treatment involves a combination of methods, although surgery is usually a last resort. The best birthmark treatment will largely depend on the age of the patient, and the type, location, size and growth rate of the birthmark. The majority of birthmarks are harmless and require no medical treatment; treatment is sometimes administered for cosmetic reasons. The majority of hemangioma birthmarks — a common type of vascular birthmark that develops shortly after birth — require no treatment and will gradually fade, with almost all disappearing by the time a child is ten years old. At times, however, the disfiguring nature of a hemangioma spurs parents to seek treatment. In such cases, the doctor and the parents will usually discuss the possible benefits of treatment and compare those to the added risks. In other cases, treatment may be necessary because the hemangioma poses a threat to the child in some way, such as one near an eye or on an internal organ. Corticosteroid medication can be used to shrink a hemangioma or to stop its growth. Prednisone is one type of corticosteroid typically used to treat hemangiomas. Corticosteroids can be given orally, applied on the skin, or injected directly into a site. An advantage of corticosteroid treatment is that it usually works within a month. Possible side effects from corticosteroid medication include the development of cataracts or the weakening of bones. If corticosteroid treatment of a hemangioma is unsuccessful, a doctor may move on to a possibly more invasive treatment — interferon injections. This treatment usually lasts several months. It carries the potential for some serious side effects, including liver damage. Lasers are sometimes used in the treatment of hemangiomas. They may stop the growth of a hemangioma or even remove it, in some cases. Pain, bleeding, scarring, and the risk of infection are all possible with laser treatment. Though laser therapy may be used on many different types of hemangiomas, they are typically more effective on a surface hemangioma than on a deeper one. Surgery can be used for the removal of hemangiomas, but it is rare. 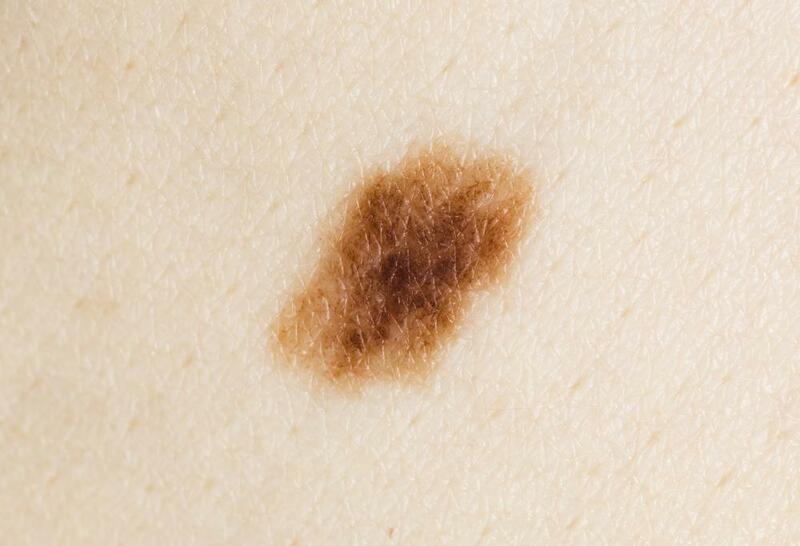 It is also sometimes used to remove a congenital nevus, a mole that a child is born with. As with other types of birthmarks, nevi often require no treatment for medical reasons. Laser is the usual treatment of choice for port-wine stain birthmarks. It has proven far more effective than any other treatment, and holds the possibility of completely eradicating what would otherwise be a permanent birthmark. Significant fading is a more likely outcome for port-wine stains. Multiple treatments are usually required to achieve the best results. 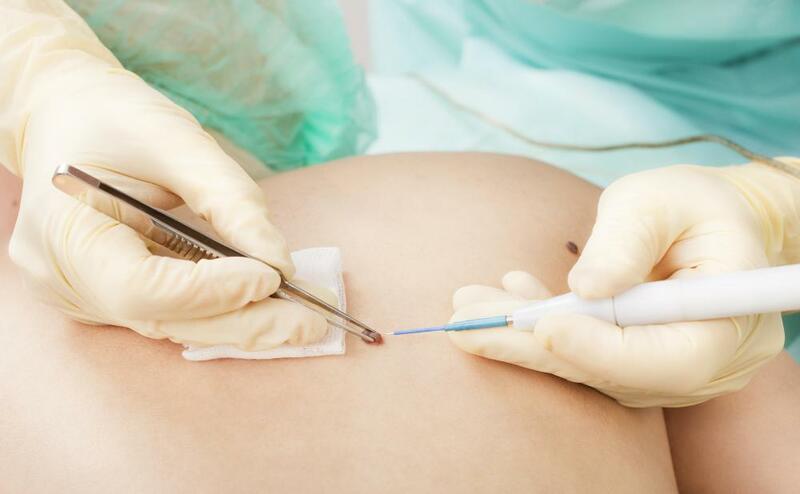 Depending on the severity of the birthmark and the age of the patient, a local or general anesthesia may be used to help lessen the discomfort of the procedure. Laser treatment for port-wine stains can be done at any age, but since this birthmark darkens and grows with age, results may be better with younger patients. Birthmark treatment is usually not medically necessary for cafe au lait spots and salmon patches, which are also known as stork or angel bites. Still, some people want the birthmark removed or at least lightened for cosmetic reasons. To achieve this, sometimes a laser is used to fade the color of the spot. What are the Different Types of Treatment for Hemangioma? What is a Port Wine Birthmark? What are Mongolian Blue Spots? What are Some Types of Birthmarks?